Happy Monday! 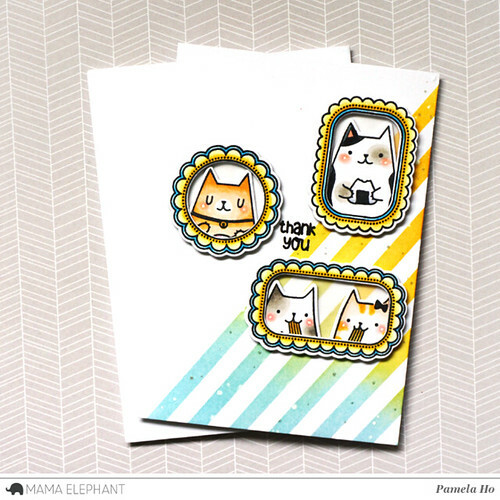 I hope you’re excited for the last 2 stamp highlights for Mama Elephant’s May release! 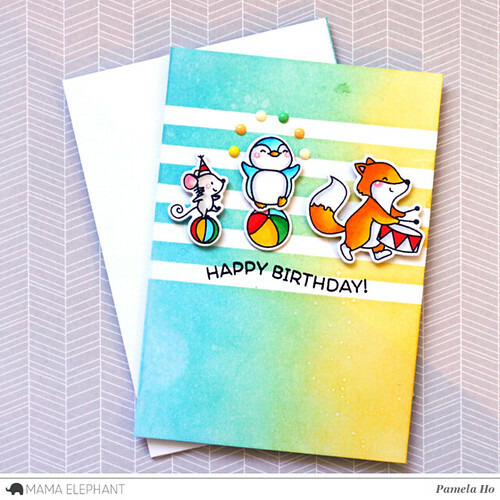 Today we’ll be looking at Animal Parade and its coordinating creative cuts. 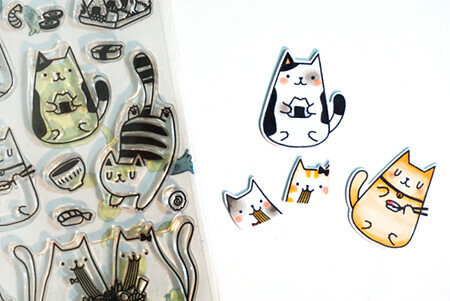 This is such a happy stamp set and I love all the little critters in there! 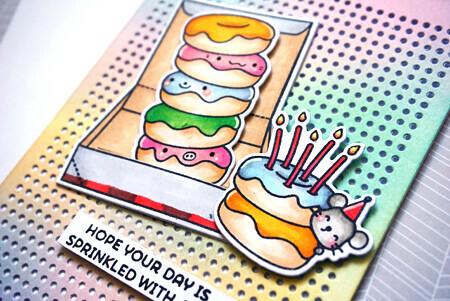 For my background, I cut out various circles and blended ink onto the card base to create the look of bubbles. I wanted this card to be bubbly and happy! I lined up all the critters starting from the tallest one, the bear, to the penguin. 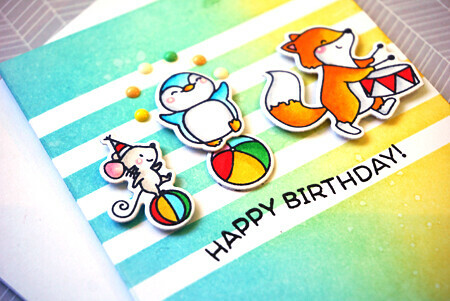 This would be such a perfect birthday card for a little child! 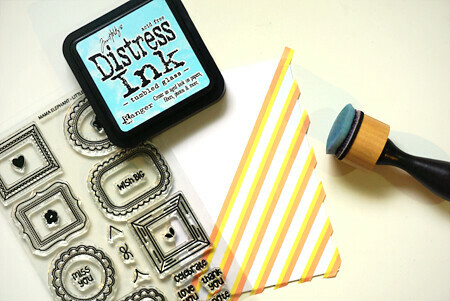 Hello and welcome back to the next stamp highlight! 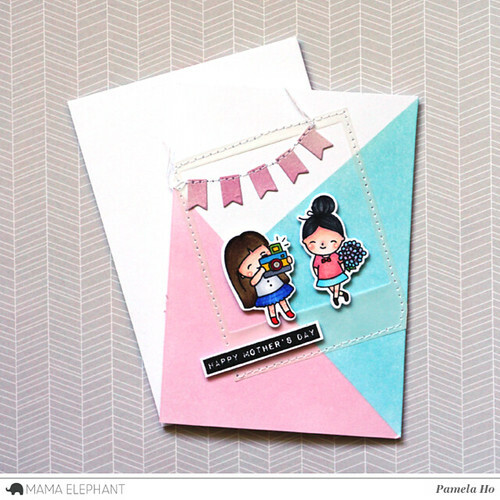 Today, we’ll be looking at Mama Elephant‘s newly released stamp set called She’s So Lovely and its coordinating creative cuts. I did some colour blocking on the card base itself with pink and blue, and stitched in a vellum polaroid frame that was die cut with Polaroid Fun creative cuts. 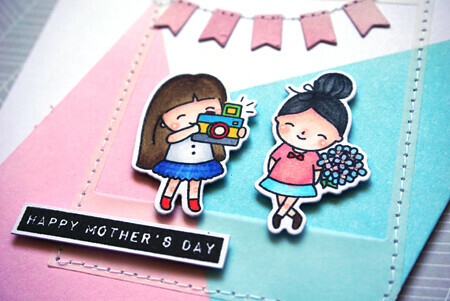 The flags are also from the same die cut set and I stitched them onto the card as well. I finished the card off with a simple sentiment from Occasional Labels. Good morning everyone! Hope you enjoyed the stampede showcasing Mama Elephant’s May release! 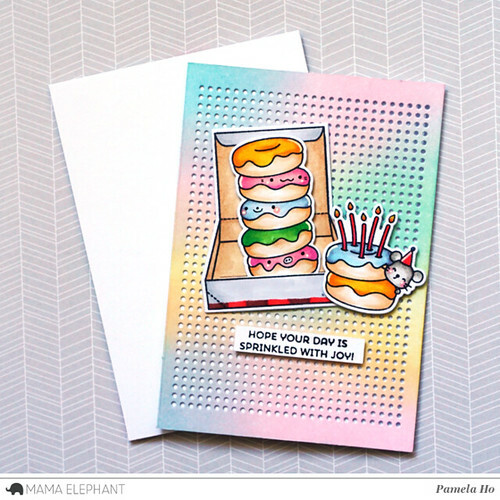 Today, we’re taking a closer look at Donut Treats and its coordinating creative cuts. I love that little slit in the donut box so you can slip all your donuts in there! For my card base, I first blended some pink, blue and yellow and ran it through my cutter with Pegworks die cut to get all those little holes. It’s such a simple yet amazing background! I coloured in my donuts and gave them little faces. Have you seen those adorable animal donuts from Japan? That’s what I wanted to recreate here! Happy May! I hope everyone’s enjoying their Spring weather these days! Today, we’ve got a super adorable stampede for you all featuring critters, little girls, and donuts! 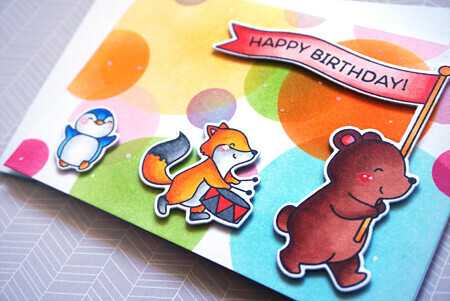 My project focuses on the adorable critters from Animal Parade. I wanted to highlight the little critters (not just the bear) and how you can play around with them. I masked off a few stripes that I’ll leave white and took my blending tool and blended the entire background. I love it when the blue meets the yellow! I only used 2 colours but I’m loving the mixing in between the 2 colours. For Mr. Penguin juggling the balls, I took out my stickers to give it a little something for the card in general. Aren’t these critters fun? Hello! 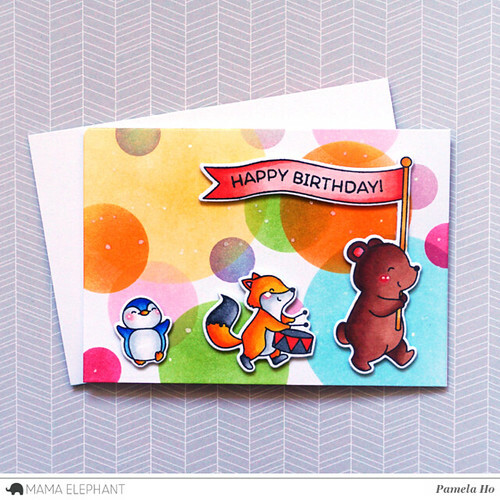 I’m over at the Mama Elephant blog with a card using the newly released Little Agenda Frames. For my background, I masked off half of the card base with some thin washi tapes for my blending. I’m going to be blending it with some light blue ink and yellow ink. Since I’m using a blue/yellow theme, I decided to colour my frames in the same colour schemes as well. I’m going to frame some kitties in them and I used Nom Nom Kitties since they were big enough to fill up the entire frame. I positioned the frames to leave some little space in the middle for my sentiment from the same Little Agenda Frames stamp set. 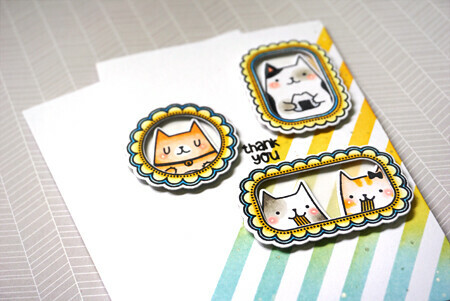 And here’s a close up of the kitties, the frames and the background stripes! Hello everyone! 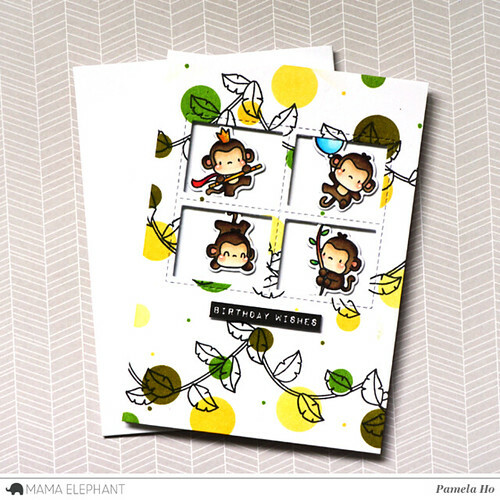 I’m back with our last stamp highlight featuring Mama Elephant‘s April release and today, we’re looking at Swinging Borders. 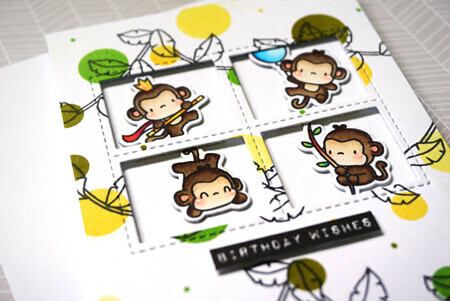 The leafy border is just perfect for the newly released Little Monkey Agenda or Birthday Monkeys! I’m using the as a background today, but instead of colouring them in, I decided to mask off circles in different sizes and blended different shades of green and yellow. 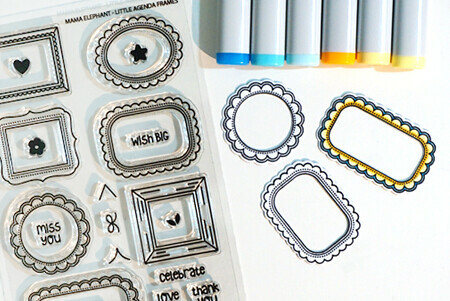 I die cut 4 rectangles using Framed Tags – Chelsea creative cuts. Each hole will be filled up with one of the monkeys from Little Monkey Agenda. Good morning everyone! 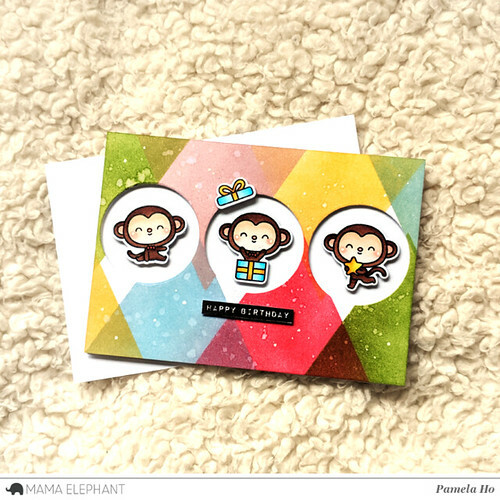 I’m back with another Mama Elephant stamp highlight for the April release and today, we’re looking at Birthday Monkeys. 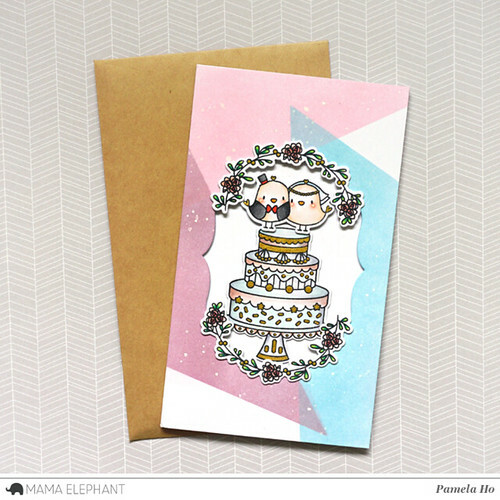 The cake in this set is super cute and versatile that I used it for a friend’s wedding card as well! 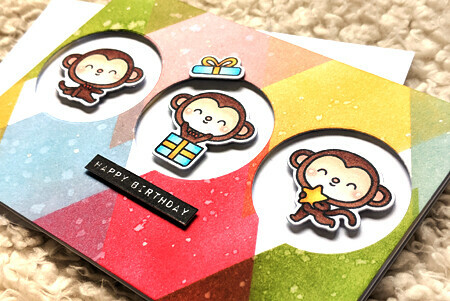 But for today’s project, I’m focusing on the three of the four monkeys and highlighted each one with a circle. The background was created by blending and overlapping the ink, finished with a sentiment using the stamp set Occasional Labels. Here’s a closer look at the monkeys and the background! I used distress inks for my blending so I flicked some white paint and water onto the colours for the lighter specks. 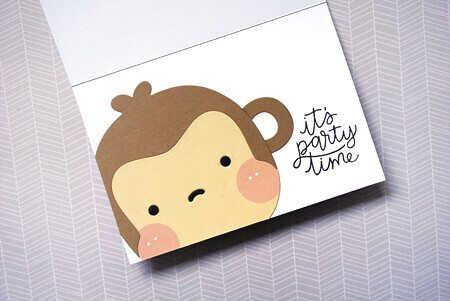 And inside the card, I used the newly released FBA – Monkey creative cuts with a sentiment from Scripty Bday.